New 45mm Twin Dellorto Carbuertor conversion kit. Jensen Healey nirvana. Nothing beats port on port carburetion, looks alone should convert you. Best and quickest way to see more power. Dellortos were standard equipment on almost all non-U.S. bound Jensen Healeys, so no wonder they look at home on this car. Dellortos have the required enrichment that Webers cannot provide on the 907 engine. These are the highest quality, refurbished, 45mm Dellorto (hard to find) tri-jet carbs,, correctly jetted for a 2 or 2.2 liter Lotus 907 engine (ideal with 107 to 104 cams - the hot tip JH set up). Comes with new mounting hardware, o-rings, studs, Thackrey washers, factory trumpets, special, stock Jensen Healey Dellorto throttle linkage, manifold gasket and the difficult to find reconditioned Lotus European intake manifold. They are a work of automotive art. Dellortos ceased manufacturing carbs in the mid 90s and new 45s are impossible to find today. Let's face it, nothing on earth is better than awesome running, port on port, carburetion and the silky-smooth performance of Dellortos. This is a fantastic kit that will provide the smoothest power you can ever imagine. Note: For a conversion on a Federal spec JH with Strombergs, youll need to remove the vacuum capsule on the distributor and wire down the retard plate (a fairly easy job). 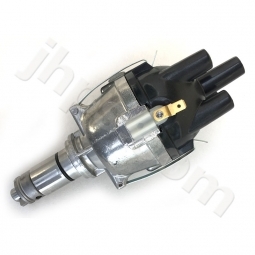 Or go for one of our extra-cool, remanufactured mechanical advance distributors (see sidebar).